When it comes to looking after your teeth and gums, regular visits to the dentist are only half the job! The other half involves taking good care of yourself at home. Here are some handy tools for keeping your mouth in tip-top shape! 1. 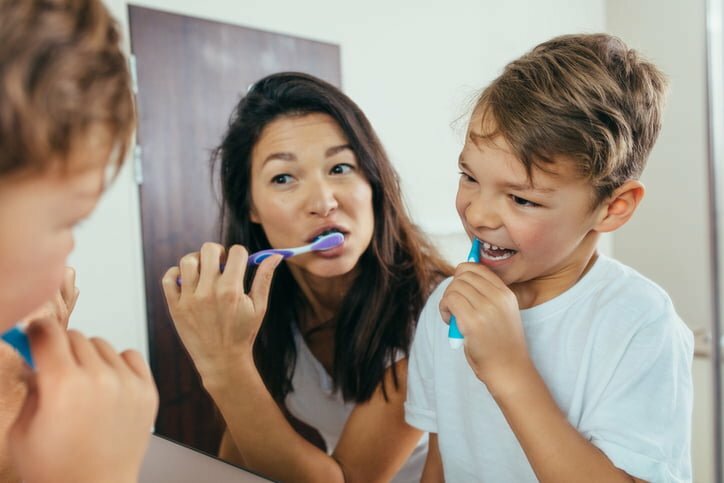 Toothbrushes – we only recommend soft toothbrushes as hard and even medium toothbrushes can be abrasive over long periods of time. Soft and fine toothbrushes are much more effective getting into smaller contact areas where plaque can accumulate. A small-headed toothbrush is even better as it is easy to handle and navigate through all areas of the mouth. An electric toothbrush can be recommended for those who have difficulty handling a manual one but note that there is absolutely no difference in terms of efficacy between the two. 2. Toothpaste – there are hundreds of toothpastes on the market. However, the dental profession generally recommends use of fluoridated toothpaste from ages 2 onwards. There are specific toothpastes for infants (ages 2-6) which contain lower concentrations of fluoride. For ages 6+, regular fluoridated toothpaste should be strongly advocated and used. Sensitive toothpastes also work well, though many patients use them ineffectively. To gain the most benefit, a small amount should be smeared across sensitive areas with your finger and left for at least 2 minutes before spitting it out (do not rinse it out as this will decrease the desensitisation benefit). 3. Floss – there are places even your toothbrush cannot reach. For the small spaces in between your teeth, floss should be used. Often a waxed floss can be more comfortable to use as it slides a little easier compared to unwaxed floss. There are also floss holders on the market (though nothing beats 2 fingers!). For patients who have complex bridgework, “superfloss” can be purchased which has the ability to be threaded underneath such dental prostheses. Patients who have large gaps between their teeth where floss is insufficient can use interdental brushes which look like ‘miniature pipe cleaners’. 4. Mouthrinse – not everyone needs or uses mouthrinse. For those who find it beneficial, we recommend using a fluoridated one. There has been much media concentrated on the potential link between alcohol-containing mouthrinses and the development of oral cancer. Because of this reason, we recommend using an alcohol-free mouthrinse. 5. Tongue cleaners – the latest science show very haphazard evidence that indicates that the use of tongue cleaners can reduce bad breath. Tongue cleaners have not been shown to significantly reduce the amount of decay experience yet. However, if you feel that you are benefitting from the use of one, we will support your decision wholeheartedly.